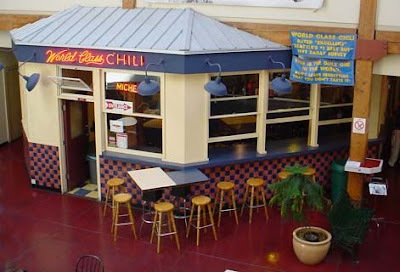 It’s been more than a dozen years since I tasted my first bowl of Joe Canavan’s World Class Chili at a Pike Place Market hole-in-the-wall in the South Arcade. I recall sitting at a counter stool with a view of Elliott Bay, spooning into a Texas-size-bowl of Joe’s Cincinnati red with its hints of chocolate and cinnamon, and thinking: “Wow. This stuff is great!” That was back before he moved the shop to larger, more central quarters in the Market’s South Arcade. I was so impressed with Joe’s chili, I once ordered six gallons of it — to serve to out-of-town guests aboard the Sea Scout sailboat Mac and I chartered the night before our wedding. A day of intense thunderstorms turned into a moonlit Seattle evening as we made our way from the Center for Wooden Boats out to Lake Washington and back. My friends and family are still talking about the chili we ate along the way. Having overestimated our needs, though, there was plenty leftover, and when I stopped in recently to pay Joe a visit (and, not incidentally, to knock back some Cincinnati red with seashell pasta and a side of cornbread), I busted his chops about the decade-old quart of “wedding chili” I was sure I still had hiding somewhere in the recesses of my basement freezer. Got a laugh out of him, too.